LEWISTON — The Public Theatre will present a new version of Maine author Elizabeth Peavey’s beloved play, “My Mother’s Clothes Are Not My Mother,” on Nov. 10–19. The heartfelt and humorous story about mothers and daughters and loving and letting go has attracted sold-out crowds and been performed to standing ovations for the past six years. When Elizabeth Peavey’s mother passed away, she was faced with figuring out what to do with her mother’s “stuff.” And so began a funny and poignant journey that Peavey turned into a play. The entertaining and moving story takes a daughter forward and backward in time, from child to caregiver, as she sorts out the contents and memories of a life with and without her mother. Winner of the 2013 Maine Literary Award for Best Drama, The Public Theatre recently received a $10,000 grant from The National Endowment for the Arts to further develop this story that powerfully resonates with baby boomers. Months of rewrites and rehearsals later, it’s ready to launch. The new script takes a deeper look at caregiving and tackles the thorny questions: What does a parent owe a child, and what does a daughter owe her mother? Director Janet Mitchko and the team of professionals at The Public Theatre have helped to elevate the show to a new level sure to satisfy its many die-hard fans. Peavey is an award-winning writer, performer, educator and author of three books, most recently, “Glorious Slow Going.” Her humor column, Outta My Yard, can be found at thebollard.com, and she has appeared in Down East magazine since 1993. The public is invited for Wine-Down Friday, a free preshow wine sampling courtesy of Rails Restaurant at 6:30 p.m. Friday, Nov. 17. “My Mother’s Clothes are Not My Mother” will be performed at The Public Theatre, 31 Maple St., Nov. 10, 11, 12, 17, 18 and 19. Performance times are 7:30 p.m. Friday and Saturday, 2 p.m. Sunday, with an added matinee at 3 p.m. on Saturday, Nov. 18. A free post-show discussion with Peavey and Mitchko will follow the Sunday matinees. Tickets are $20 adults, $17 groups, $5 under 18. Tickets at 207-782-3200, or thepublictheatre.org. 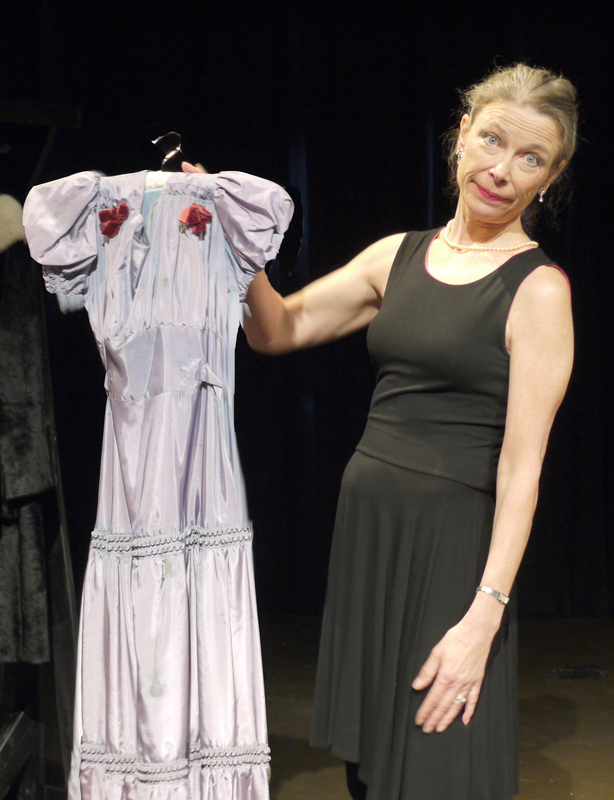 Elizabeth Peavey in a scene from her one-woman play “My Mother’s Clothes Are Not My Mother,” opening at The Public Theatre in Lewiston on Friday, Nov. 10.